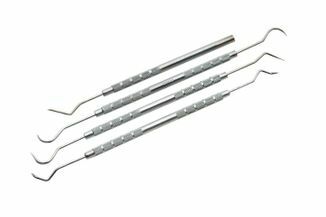 Stainless steel pick set. There are 4 pieces with various pick configurations. Many uses like modeling, antiques re-finishing etc. For hobby and industrial uses only, not for medical use. We also have a set made of carbon steel, also not for medical use. See dropdown menu for choices. We also have single probes for $1.45 each. Same stainless steel. Great for hobbyists, jewelers, gunsmiths, etc.